I first introduce the Infinity Global Stock Index to readers in 2014. 5 years later, I think it makes sense to do an update since the landscape for passive investing have changed. One way to build wealth, but don’t want to actively manage it, treating investing as a form of accumulation is to passively invest in a diversified portfolio. And one of the best way is to invest in a diversified portfolio across the world as if you are purchasing a group of the stalwarts around the world. If we know that it is hard to pick the right active manager, the best way is to invest in a low cost fund that tracks a World Global Index. 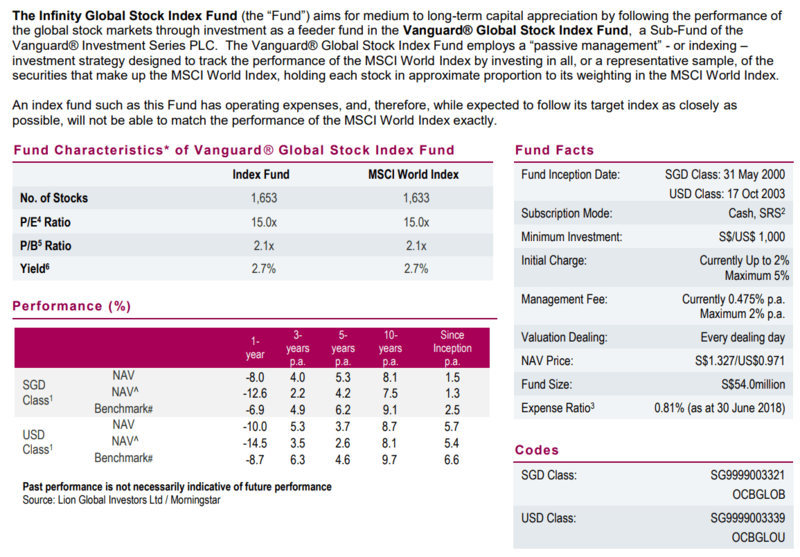 Most investors did not know that there are 3 feeder index funds that enables you to invest in Vanguard in Singapore. They were brought over in early 2000 by then OCBC Asset management, now Lion Global Investors. If you want to keep things simple, and own majority of the corporates in the world passively, Infinity Global Stock Index Fund fits the needs. The Infinity Global Stock Index fund has an advantage because a lot of Singaporeans are familiar and know how to purchase it. In the short term, the value of your holdings can be very volatile. Your value at the worse case in the depths of 2008 can go down by 50%. Can you bear with that? Global growth of corporates in the world can stagnate or deflate in 20 years. There are always pessimists in the world. If you firmly believe we are in such a scenario, this is not for you. The Infinity Global Stock Fund is a unit trust. And with it there is a bunch of costs associated with owning the fund. Later in the article we will talk about why costs matter in investing. As Singaporeans, you have various ways now, compared to in the past to invest in a low cost global equity product. You do not always need to invest through the Lion Global Infinity Series. There are however, different costs, some visible some hidden. Infinity Global have certain advantages over #1 and #2. In other areas #1 and #2 have advantages over Infinity Global. Some of the costs are recurring. Those are the costs you should take note of more, than the one time one because they are going to compound over time. One cost that you should take note of is I Estate Duty/Death Taxes. Certain funds/ETF domiciled in certain countries such as USA, UK levy a 30%-50% tax on the amount of money you have within the country after a certain minimum amount. This gets very murky because non of the platforms want to help you on this. They will ask you to consult your tax advisers. Some options available to Singaporeans thankfully, do not have this problem. The Infinity Series of Funds is one of them. So while you may not feel this cost now, your descendants might feel it. Some of these costs are based on discussions that I have with people investing with Interactive Brokers, IWDA and VT. By no means are they always accurate. Some hidden fees such as foreign exchange spread, bid/ask spread and tracking error change over time. Stacked together, the Infinity Global does not look too expensive versus the most cost efficient solution, which is purchasing IWDA through Interactive broker (perhaps it is an article for another day). Then again my assumptions is that your portfolio size is $20,000 currently. You will add $1000/mth to IWDA/VT or Infinity Global, and you would accumulate every half year then invest once. With the Infinity Global, the platform is much easier. There is a long topic in Hardwarezone that act as a support group how to invest with Interactive Brokers. They discuss how to fund the account, whether there are any hidden cost to get the money from the platform back into your account, and how to change to a different currency, how to read the performance report. With the Infinity Global, you can have an automated regular savings plan, where the money from your bank account funds the passive fund automatically without you doing anything. The minimum amount is SGD $100. The complexity of the DIY manner and the ability for you to invest in small amounts with less human intervention help people to start more easily and prevent your behavioral issues from destroying your portfolio. 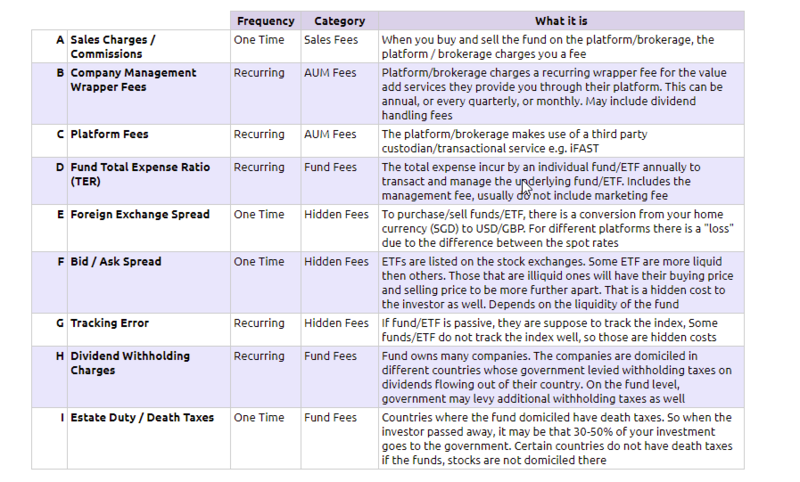 A recent factsheet of Infinity Global Fund can be seen here. 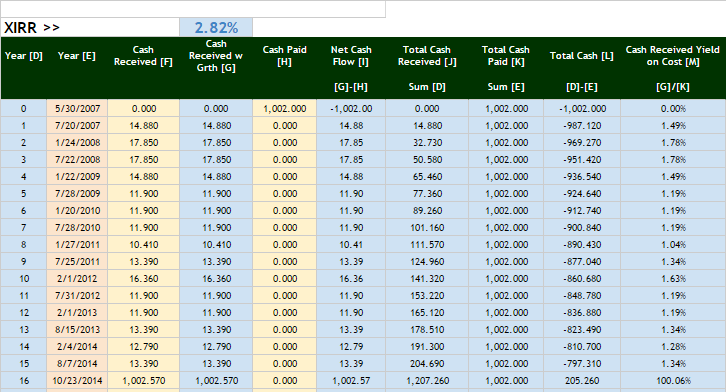 Here is Fundsupermart’s sheet. The SGD Class fund was incepted in May 2000 which is almost 19 years ago. The USD Class fund was incepted in Oct 2003 which is around 16 years ago. You will observe that there are 2 column of NAV: NAV and NAV^. 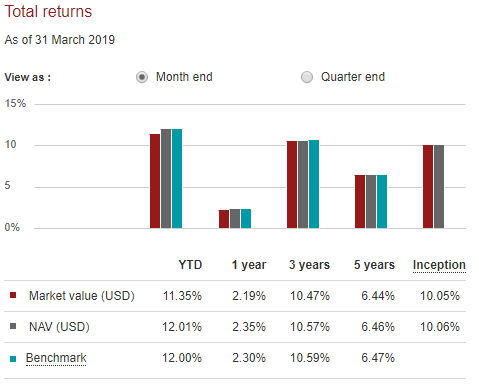 NAV stands for the returns in % of Net Asset Value of the basket of stocks, while NAV^ is the returns after preliminary charge. Observe that the charge (difference between NAV and NAV^) can result in a difference as high as 2%. This indicates the effect of higher cost to your investing results. The results since inception is rather poor. The Infinity Globals 18 plus years result is almost 60% of the benchmark before the preliminary charge. Year 2000 is not a year to start a fund but honestly I would have expected the fund to be doing better than 1.3% to 1.5% per year. On a 10 year basis the result is less than the benchmark but it is closer to the expected return of 6%-9% that people are using in their projection. You have seen me mentioned about cost a few times in this post. Something about the expense ratio, the sales charge, withholding taxes. Why is cost important? Because we think that it has a large impact on your returns. 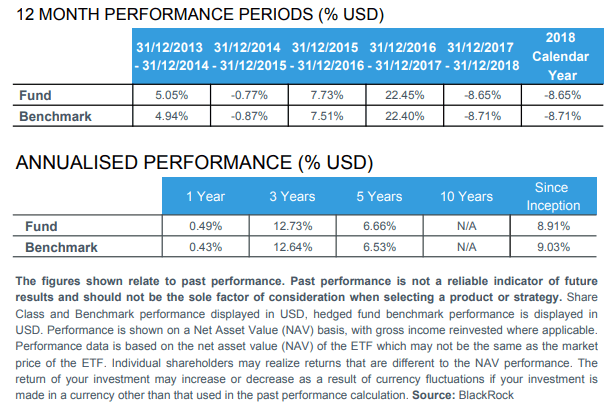 If we revisit the Infinity Global’s factsheet, a fund that tries to mimic the index, should achieve close to the performance of the index. However, over the long term, the performance of Infinity Global is about 60% of what the benchmark index achieved. The likely reason for the loss is if we account for costs. 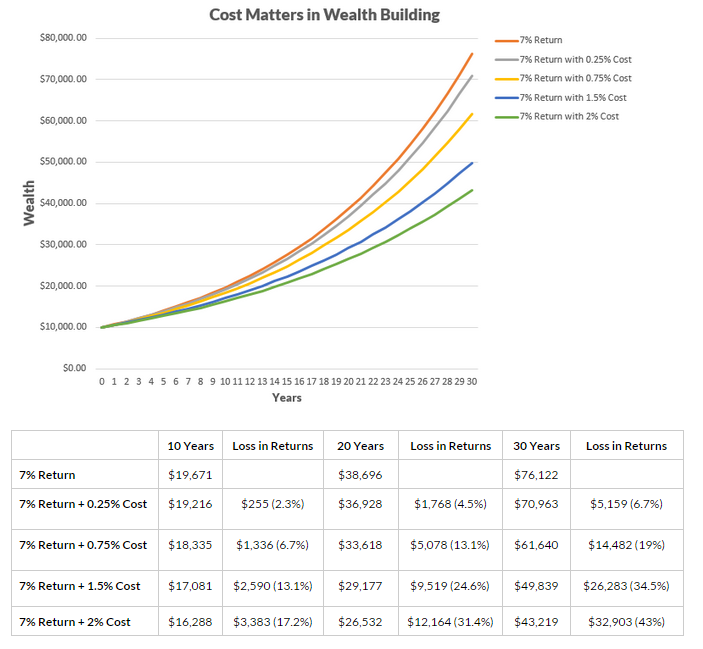 The illustration above shows how much $10,000 will grow to in 10 years, 20 years and 30 years, if the compounded average rate of return is 7%. If you add a little cost of 0.25% to it, we start losing some returns. If we add 0.75% cost to it, we start losing more returns. The longer the horizon, the greater the cost compounds. 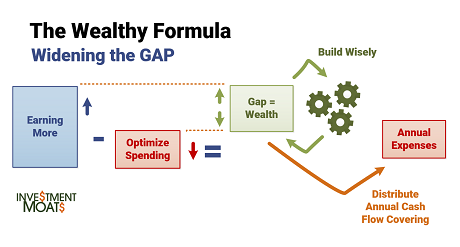 You would not know whether you will get 4% to 10% over the long run, but you know your costs will always be there, and the cost is compounding. 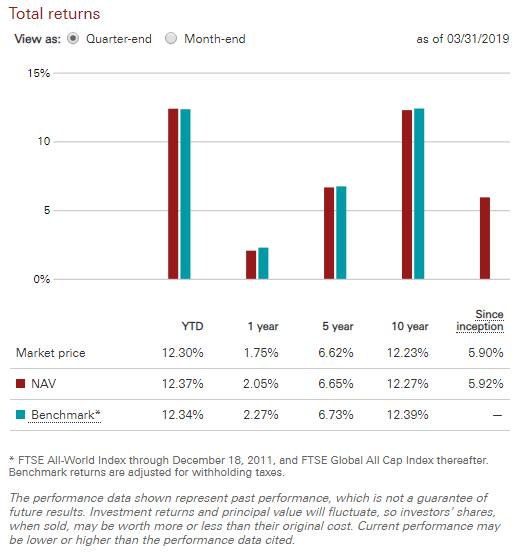 The Infinity Global’s NAV versus the benchmark returns has a 1-1.5% difference. The overall expense ratio of the fund have came down from 0.95% 5 years ago to 0.81% now. This is a very good thing if cost is that important. However, let us see how the other funds are doing. The table above shows the returns for Infinity Global. Notice the deviation of the NAV from the Benchmark. The performance table above shows the performance of VWRL. The NAV at times are better than the benchmark. This is likely due to the great execution of Vanguard to get out certain advantages through a combination of lending out their shares, sequencing their buying and selling. Similarly, VT’s performance is rather close to the benchmark as well. They do not get the kind of outperformance over certain duration as VWRL, but the NAV is pretty close to the benchmark. The last ETF, which is IWDA has performances that is pretty close to its benchmark as well. In truth, instead of 58 funds there were 95 funds in total, but I decided to narrow down to only SGD funds. Doing this would allow us to compare its performance as a mechanical passive benchmark index against those with active managers. Its results to me are pretty stellar. The Infinity Global ranks top among the 16 funds that have a 10 year history. On a 5 year basis, it ranks third among 30 funds and 7th & 9th on a 3-year, 2-year basis. In the short run, the market is a voting machine. In the long run, it is a weighing machine. The longer term results especially 10 years is important because that is usually how long you should be looking at holding a fund like this. Short term-wise they can gyrate up and down, but longer term you should expect the Infinity Global to be above 50%. Why did the Infinity Global did well in the long term? The higher cost of active funds starts to impede the fund’s returns. Since I updated this in April 2019, Let us contrast this to the data in Jan 2014 or 5.4 years ago. Did the Top funds 5.4 Years ago Remained as Top Funds? Since I am updating this post in 2019, I thought let us look at how the top funds did 5 years ago now. You think you can pick the top fund, managed by the top manager, or the best fund recommended by Fundsupermart, or your financial adviser. Since I only included those funds with SGD, I tried searching for Fidelity FPS Global Growth USD but cannot find it. I also failed to find the First State fund. UOB’s United International Growth, did better 5 years later. If you know what happened to the Fidelity and First State fund, do let me know. I wonder if its a case of poor performance or strategic review, resulting in them closing down the funds. I would not be surprise some of the 16 funds with 10 year track record close down 5 years later. This is the reality of the fund management business. One thing you will notice is that at different time periods, there are no best performing fund throughout the different time periods. At different time frames, its difficult to pick the best fund. To pick the best fund going forward, you have to look at their past track records. Given this data, you would probably pick Fidelity FPS, but 10 years in, it turns out that Aberdeen Global performed best. Yet Aberdeen Global hasn’t been performing the best for these 5 years. So how do you resolve that? In 2019, We know that Aberdeen Global didn’t turned out the best. I cannot find Fidelity FPS Global Growth . In hindsight we should all choose Nikko Shenton Glb Opportunities. And there in lies the difficulty to pick good managers that last for 20-30 years. If you are advised by your investment advisor or insurance agent to purchase an investment linked policies, you will realize the choices are limited. What if the best funds available is not within the choices? You may have to endure mediocre results. For those who understands passive, low cost investing, the Infinity Global Stock Index fund is a unit trust that allows you to start small and save up your money. It allows you to de-accumulate in retirement as well. The landscape have changed a fair bit since 2014. We have many robo platforms that offer competing solutions. So they might make the Infinity Global Index fund less unique. It is pretty nice to see how well the fund performance did against its actively managed peers. However, the difference between the fund’s NAV and its benchmark might make the ETF solutions through your brokers more appealing. Still, my friend Gregory from Endowus will say that at this cost, it is still too expensive for the retail investors. We will see if we can see products that are either better in performance with lower volatility, or that it is cheaper. I enjoy financial blogger Cullen Roche’s work at Pragmatic Capitalism a lot. What I enjoyed the most is of him trying his best to take a common narrative that is popular in the media and provide a fresh perspective. Put it another way, he often offers an alternative thought to the common narrative, without being seen as a bear or fear monger. It is when you hear his explanation of some deeper economic topics such as the world printing money, gold and such that you appreciate a fresh perspective that is not too slanted. The passive investors will not be happy when he describes their approach to be not reflective of the total market for one important reason: bonds and debts make up a large part of the world’s net worth on top of equity. In his recent article, he decides to put the microscope on Japan. As most of us are aware, since 1989, Japan’s equity have endured what is a 25 year old bear market, where prices are still below that high. The common narrative is to use the Japan case study to answer: What if you invest in one country and that country exhibits the same issues as Japan. How would your retirement look like then? Cullen’s argument is that, like many of the indexing speak, much of the narrative is on the volatile equity markets in the home country, while we tend to ignore that of the debt markets. Bonds are traditionally less correlated with equities, but have a positive expected return in the long run. Therefore, they make good diversifier in our portfolio. Problem is that for individual stock pickers or even indexing folks, they tend to be ignored. In the case of Japan, the performance of the JGB over this 25 years have been 4.9%/yr. This gives a 60% equity and 40% bond portfolio a 2%/yr return over the period. 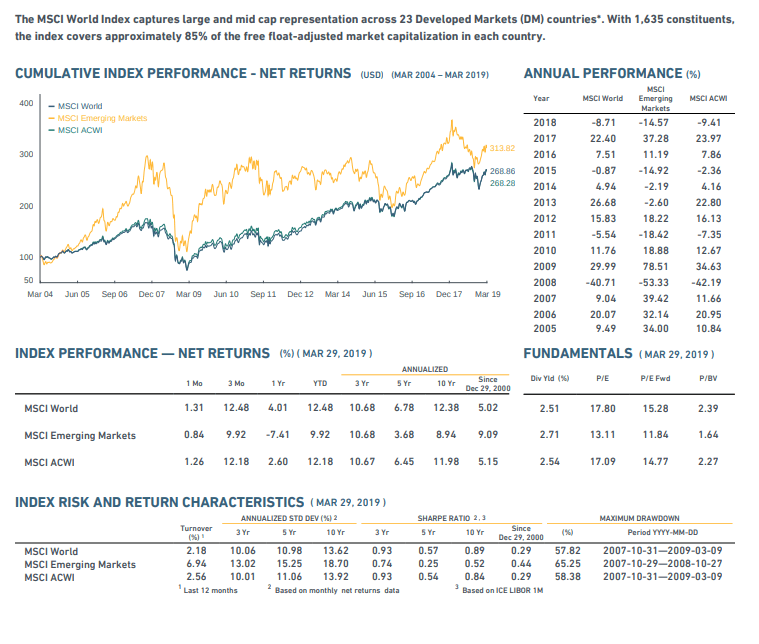 The result improves further if we introduce a MSCI World Index fund into the equity mix. So the allocation is 30% Topix, 30% MSCI All World Ex-Japan and 40% 10 Yr JGBs. That will generate a 5.2%/yr annual growth rate. The key takeaway for myself was that, I have also buy into the idea that some countries will end up with a profile similar to Japan, and that would not be good for the investors who have an extremely strong home country bias. My solution to that scenario would be to have a world stock index equity allocation added to the home equity index. What I omit is the role of the bond in that allocation. It is probably why the Bogleheads advocate the simplest portfolio is one where it includes a home equity index, an international index and a home bond index. 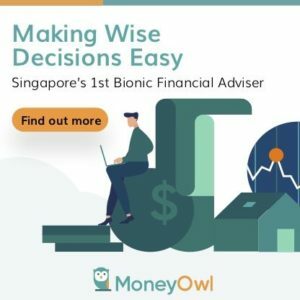 We talk a fair bit about a rather passive approach to index investing in a USA context and Singapore context with the Infinity Global, STI ETF and the POSB Invest saver. Writing a rather comprehensive guide that brings you through how to get started and a blueprint portfolio allocation is difficult. You have to think with much parameters and there is seldom a one size fits all solution. Don’t worry. It won’t cost you an arm and leg. This guy looks genuinely wants to help provide the resources to help the average folks built wealth in a sensible way. Its provided free on his site. A note of the difficulty is that, his recommendation for the global ETF is to use VWRD the US dollar version of Vanguard’s FTSE All World ETF listed on the London Stock Exchange. There is an inheritance tax in UK where currently if the investor held assets greater than 300k pounds, and the investor passed away, the assets may be subjected to 40% inheritance tax. This is the difficulty when it comes to selecting an ideal ETF to simplify wealth building. The alternative is to take on more cost with the Infinity Global Fund or to form a global allocation with Vanguard ETF based in Canada, where there currently do not have these death taxes. If you would like to forgo an allocation that captures the world, there are Vanguard ETFs in Hong Kong that tackles the Asia Ex Japan region, where there are no death taxes and dividend withholding taxes. In the past I wrote two posts sharing about a friend who starts dollar cost averaging 2 months before the great financial crisis. As a primer, the STI ETF is like a listed unit trust that mimics what stocks are held in the Straits Times Index, an index of Singapore Blue Chips, or largest companies in Singapore. If the index go up 1%, the fund must go up 1% and vice versa. You are entitled to received dividends, as the underlying blue chip business distributes dividends so the STI ETF, at the discretion of the manager, distributes an average dividend. You pay a brokerage commission to buy it and annually there is a 0.3 to 0.4% expense for the internal cost of managing it. The two articles studies the effects of disciplined dollar cost averaging way to build wealth with a single country based index (Singapore). The second article provides an encouraging result in that the IRR turns out to be 5%. However, one thing that bugs me is how that original investment 2 months before the GFC would have turned out if its not a dollar cost average, but a lump sum investment. That first purchase was carried out at $33.61 or some where when the STI index is at 3300. If you study the STI Index you will realize that the price of the index is barely above 3300 for the past 7.5 years. The highest point reached was 3500 and momentary at 3800. 7.5 years and we are still below it. The DCA results show that if you put in your hard earned wealth fund in the STI ETF, you would end up positive. In the case of a lump sum, you would have lost money. However the dividends distribute over the past 7.5 years makes up for the disappointment. The IRR up to now is 2.82%. That’s somewhat like an insurance savings endowment’s rate of return. There are folks that tell me this is too low of a return, to justify the kind of stomach wrenching volatility they need to go though. That is fair enough. To invest with this approach you have to understand the philosophy of what is necessary, and a large part of it includes how ETF investing works, what you need to do and behavioural finance (or how your brain will make you do stupid things). We won’t know what the future would bring, and I find there is too much things sold based on USA based indexing that preaches you will make 7% returns per annum. This is as if all country will mirror the returns of USA. When it comes to single country index investing, things might not be so simple after all. Still this studies does show the ability of dividends as a form of market return that should be counted as part of your return, and an important part at that. The story is not completed yet, there are still many years to go.